As Presidents Day approaches, it’s a good time to explore the homes, museums, and libraries that honor our nation’s leaders. Located on quiet corners of small towns, stretching for blocks in large cities, or simply tucked into corners of university campuses are sites honoring U.S. presidents. Most presidential museums and libraries have stepped into the 21st century with family-friendly, interactive exhibits that help visitors understand that U.S. presidents had lives apart from being commanders in chief. The Office of Presidential Libraries, which is part of the National Archives and Records Administration, administers 13 presidential libraries. The presidential library system formally began in 1939, when President Franklin D. Roosevelt donated his papers to the federal government. However, private foundations, historical societies, and some states operate libraries for earlier presidents, including Abraham Lincoln’s Presidential Library and Museum, which is run by the state of Illinois. This center was in the news more than usual last year as both the 41st president and former first lady Barbara Bush were laid to rest on the center’s grounds on the Texas A&M University campus. 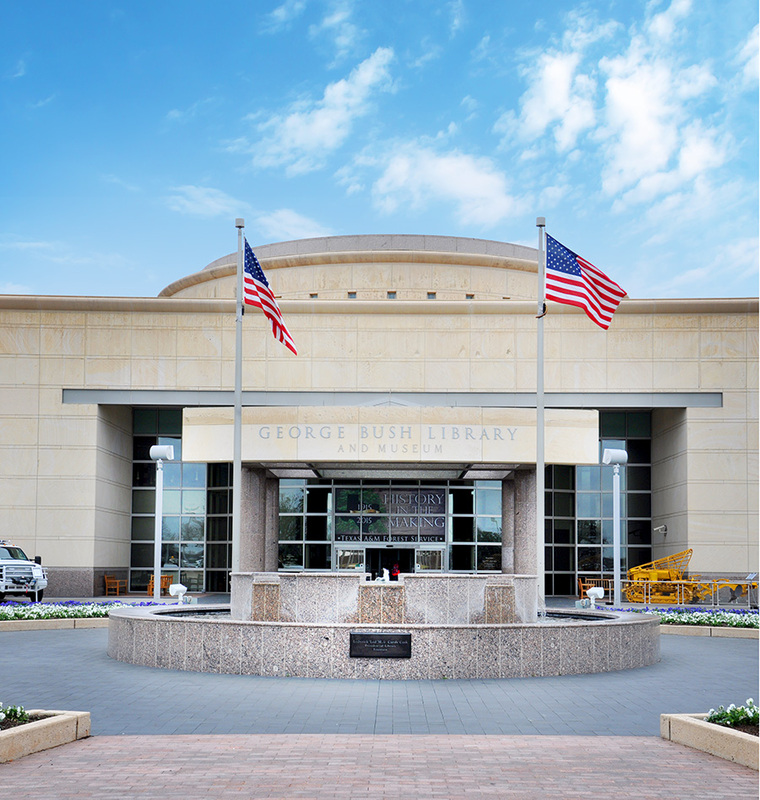 Once asked why the university was selected as the site for his presidential library, President Bush responded, “Because of the spirit of the place…the Aggie spirit.” Indeed, the presidential center is an uplifting venue filled with the can-do spirit the Bushes exemplified from the moment they decided to make the Lone Star State their home. The 1948 red Studebaker that Bush drove to Texas is on display with photos illustrating the family’s enthusiasm for their new adventure—a long way from their New England roots. Filled with more than 40 million papers, the library is more than just a repository for documents. The interactive displays, many designed for youngsters, make it one of the most state-of-the art presidential museums. After my hand was scanned and an “access granted” appeared, my movements could be tracked throughout the museum (playfully, of course). The biggest thrill, however, was sitting in a replica of the Oval Office in the seat of power. When I opened the lower right desk drawer, I found the baseball mitt that the young Mr. Bush used in 1948 when he was the Yale University baseball team captain. A large portion of the library is dedicated to Mrs. Bush and her work to promote literacy. Many of the children’s displays, including a doghouse for Millie, contain games and questionnaires to keep the little ones entertained while grown-ups can follow the interactive displays about policy decisions or experience the “situation room,” another replica of the real thing. One of the most poignant artifacts is a 7-ton sculpture titled “The Day the Wall Came Down” and featuring a piece of the Berlin Wall that was dismantled during Bush’s tenure as president. At Bush’s request, the names of the 15 people killed at the Berlin Wall were written on the Dove of Peace to represent more than 900 people killed trying to escape to the West during the Communist regime. The horses on the monument represent the freedom of the human spirit. “The untiring hope of the human spirit” is evident throughout the museum, just as the Bushes would have wanted. 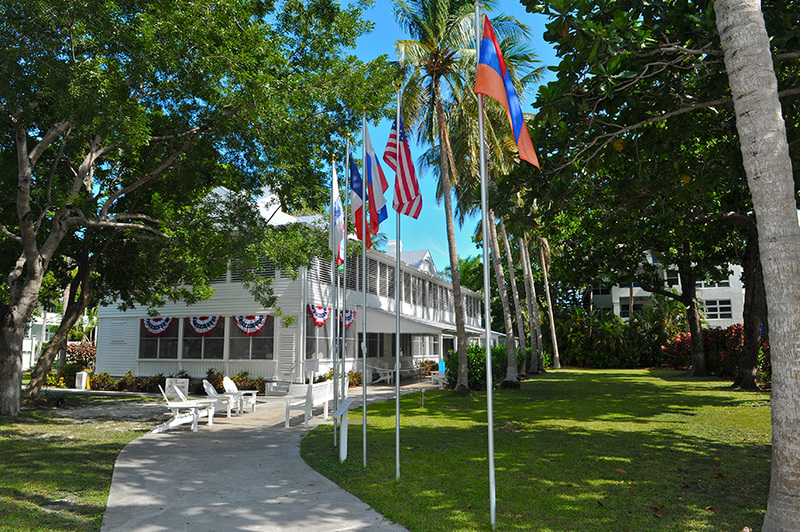 The Truman Complex meanders through downtown Key West, not far from the Southernmost Point. Tucked in the corner of the bougainvillea-lined neighborhood is the clapboard home where President Harry S. Truman spent 175 days of his presidency from 1946 to 1952. Originally constructed in 1890 as naval officers housing, the Little White House is Florida’s only presidential home. Altogether, six presidents used the home: William Howard Taft, Dwight Eisenhower, John F. Kennedy, Jimmy Carter, Bill Clinton, and Truman. But it was the nation’s 33rd president who found the home most restful and who spent the most time there. Tours are available every 20 minutes throughout the day from 9am-4:30pm. The home usually is open 365 days a year but is still used for official business and events. Visitors should check the website to make sure the tours are available on the days they want to visit. No photography is allowed inside the home, which contains 90 to 95 percent of the furnishings originally purchased for Truman. Even before he became the seventh U.S. president, Andrew Jackson was a legendary figure. He enlisted in the Revolutionary Army at age 13; he asked for 3,000 volunteers from Tennessee in the War of 1812, but 5,000 showed up, thus giving the Volunteer State its nickname; and his victory in the Battle of New Orleans launched him into the national spotlight in 1815. He had a notorious temper, but his heart was big—he fostered 20 children over his lifetime and never stopped loving his wife, Rachel, who died before he went to Washington. “I was born for a storm, and calm does not suit me,” Jackson wrote to President James Madison, the fourth president and a Founding Father. However, the Hermitage and its park-like setting belie his words, because the home and its more than 1,100 acres are an oasis near Nashville’s urban development. Jackson’s classical-style mansion is definitely the centerpiece of the property, literally and figuratively. Built in 1821, the home contains 90 percent original artifacts, including wallpaper in the foyer that is 182 years old. Visitors should make time for the “Born for a Storm” exhibit at the visitors’ center to learn about the contentiousness of politics in Jackson’s day. Arguments often were settled with a duel, as Jackson had to do with attorney Charles Dickinson. A new visitor experience includes a dueling demonstration that occasionally allows visitors to participate. “We need to engage with history in open and honest ways,” says Mike Zimmerman, an interpretative manager at the Hermitage. Just as dueling is honestly discussed, so is the issue of slavery. “We talk about slavery up front and refer to Jackson’s slaves by name,” Mike explains. 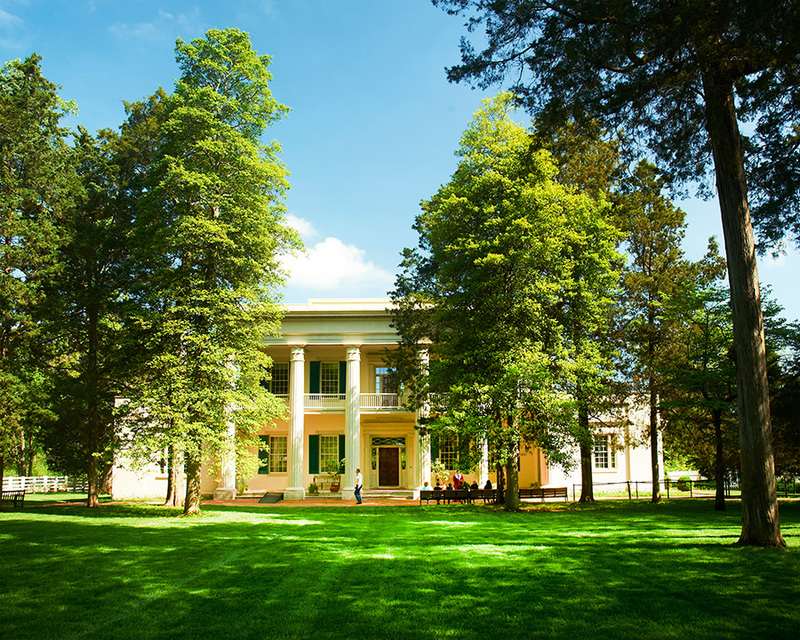 More than 200,000 visitors a year tour the Hermitage, which is considered one of the best preserved of early U.S. presidential homes.